Traveling through Thailand, and indeed South East Asia, means one thing: choosing a backpack that isn’t going to hinder your journey and make life uncomfortable on the road. 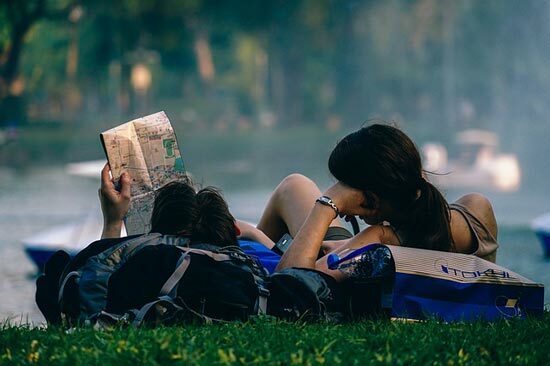 Whether taking the train to Chiang Mai, trekking across Luang Prabang, or travelling by minivan from Phnom Penh to Angkor Wat, a travel backpack can make or break your happiness. There's a slim line between cool and comfortable and hot and heavy. I'd go as far as to say it's one of the most important decisions you'll make next to booking your plane ticket. As a seasoned traveller of ten years, I'm going to help you choose a backpack by giving you my top tips on the most important features to consider. I'll give you a variety of choices too, so you can find the best travel backpack for your size and travel needs. I have a mate who turns up for a 60-day stint with a basic Jansport rucksack. He carries two changes of clothes, a laptop and a toothbrush and he's set. I don't know why, but I always end up with more than I need. So I go for the biggest, lightest pack I can get. 60-70 liters is about perfect. Don't go bigger than that if you are under 5 foot 7 though. Man, I've seen some people really struggling with 70+ liter backs on the BTS in Bangkok. Think of your poor body in the heat. Extra weight means extra energy required to support that weight, which mean extra sweating. However, in my opinion, it's better to have a bit more space than you need. Why? Because you will buy a few things on the road, no matter what sort of budget you are on. Maybe you will collect some shells or stones on the beach, or buy a couple of t-shirts or handicrafts for the folks back home. Don't leave with a pack stuffed to the brim. Leave some space for things you'll pick up along the way. 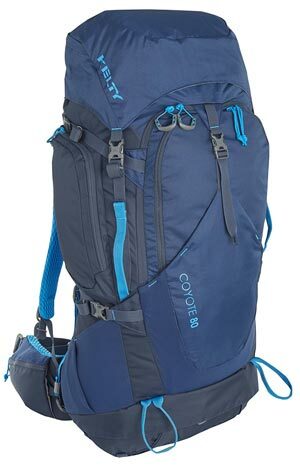 Kelty does some great backpacks that go up to 80 liters, like the one below. This Kelty Coyote packs in 80 liters! If you're female, with a smaller frame, and want something super light. check out the Osprey below. It says this is for women, but honestly, the weight of the bag and the features make it an attractive proposition for anyone really. Just 2.19kg! Also has adjustable torso length. Many backpacks now open like a suitcase from the side but also provide access from the top. This can be really useful. It's important when travelling because there are moments when you need to shove your hand inside quickly and access an item of importance; perhaps a document or some toiletries. Having only one entry point usually means having to spill everything out onto the floor, which is not only frustrating, but also makes you a vulnerable target for thieves. Older style packs have one main entry point and tie up with a drawstring at the top. This makes the pack fiddly to open and hard to access. Imagine you’re trekking and come across a great stream to cool off in. You’ve only got twenty minutes to make the most of it, yet it takes you ten minutes to free your swimwear from your overly well-organised packing system. Or you're at the airport, with 30 minutes until your flight, and you realise your passport is in a jacket somewhere in the middle of your bag. With a good backpack, you can lay it down, unzip it and extract what you need without disrupting the entire bag. Make sure your backpack has multiple entry points, big enough to access an item in any area of the bag (see above). This High Sierra opens like a suitcase & has top access on the front bag – which is detachable into a day pack. If you’ve ever taken the bus across the friendship bridge into Laos, you’ll know you’ll need a backpack that can be picked up quickly to wing-it through immigration as you hurry from the minivan,. You'll also need one that stands upright when you board the bus with barely an inch to move, otherwise you will be laying people out if you keep that pack on your back. Not to mention that having the luxury of carrying your bag sideways will give your back a much-needed occasional break. In fact, there will be many a time on your epic adventure when you need your bag to behave itself, and having those top and side handles will become a blessing in disguise. Paying that bit extra for a pack with soft cushioning on your spine shoulders is essential too. The top handle must not protrude when it's pushed down, as you don't want to feel any metal/plastic on your back when travelling around. 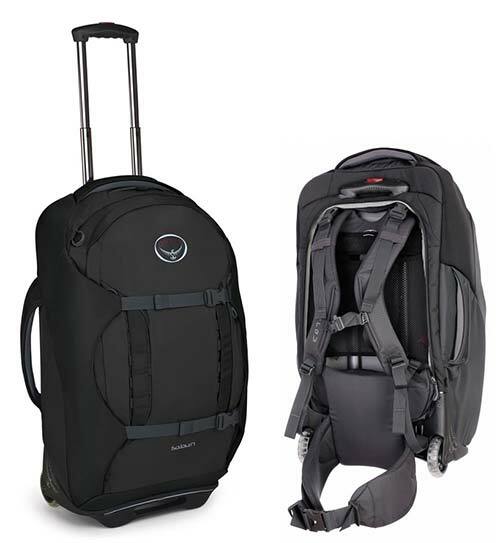 This gorgeous Osprey backpack has wheels, a side handle and multiple access points. A day bag is essential for one key reason: you won’t want to lug your main pack everywhere all the time. Also consider flights or bus trips when you want your main bag stashed under the vehicle and a separate lighter bag to carry on. Travelling can take its toll on your energy levels and your back, and although it can be tempting to just take the one big bag, you should take a smaller detachable bag to roll with on smaller journeys. Perhaps you'll go off kayaking for a day, or spend a few nights on and island. With a day pack you can lock up your main pack, leave it at the hotel/hostel (take all valuables with you or put them in the hotel safe) and explore with your big pack’s lighter cousin. Of course, you could use a standard rucksack as a day bag, but an integrated, detachable bag not only looks cooler, but is super efficient for bus, minivan, train and plane journeys. 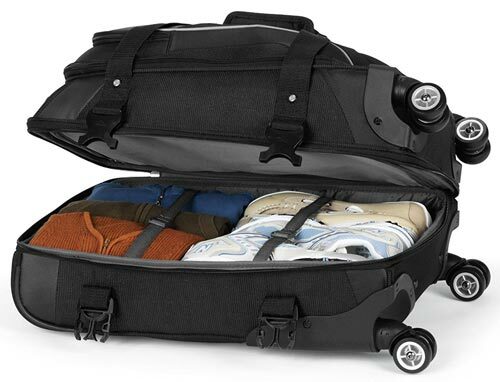 It also keeps all your stuff together when checking into hostels and bungalows and getting on and off transport. It’s peace of mind to know your bags are locked together and can’t be separated without some serious effort. This Deuter has a rucksack that detaches from the main bag to offer a smaller option for planes & around town. To have wheels or not to have wheels…that is the question. Personally, I like wheels, because when I fly into huge airports like Bangkok’s Suvarnabhumi, I can wheel my bag and give my back a rest, not to mention making it first to the immigration queue. However, if you’re travelling through the jungles of South America, you won’t be doing any wheeling, so you might argue it's not an essential feature for you. 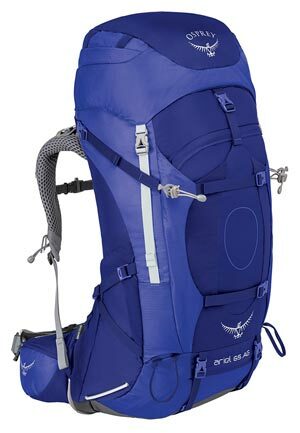 But here’s my take on it: Modern backpacks, like the Osprey pictured below, seamlessly incorporate wheels that you’ll barely notice until you’re whizzing along past all the other’s slow-boating on the way to the visa checkpoint. Wheels add hardly any extra weight (none that you’d notice, anyway) to the pack and therefore they’re a feature well worth having. Moreover, if you buy a top quality backpack, you’ll be using it on multiple trips, and at some point those wheels will come in handy. Wheels is one of those extras you'll regret not having; kind of like electric mirrors on a car: you don't wish you had them until some loon swipes one off when you're inside the store. 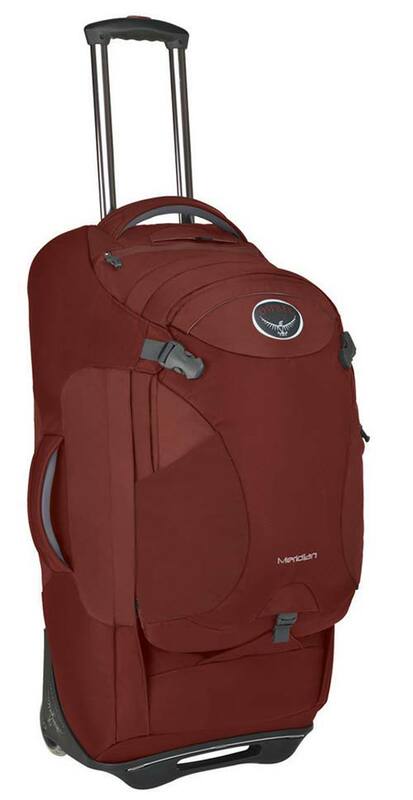 For me this Osprey Meridian Red is perfect: Wheels, side opening, top opening, and detachable day pack. AWESOME! For a super-duper travel backpack that will get you around Thailand and South East Asia, and safely back home again, without breaking, or breaking your back, any of those pictured above will do the job. In my experience, Amazon is usually the cheapest place to buy the top brands like Osprey, Deuter Northface, Kelty, and High Sierra. Use the filters onthe left-hand-side of the page to select by brand and budget. With Amazon, multiple sellers offer their stock in one marketplace, which naturally drives up competition and reduces prices. If you visit an independent store, you are only seeing the one price. You can often save quite a bit if you buy last season's model too, because they drop the prices on old stock when the new models come in. Next up, you'll need to get travel insurance. Don't worry, I've got you covered right here. Hi there, I'm flying into Bangkok, and travelling for 11 weeks throughout Thailand, Vietnam and Cambodia. I'm not sure which bag to bring as we will be doing some hiking but not loads, and will obviously be moving from place to place every day. Thanks a lot, this article is very helpful by the way! Buy a ticket from level 1 gate 8 in the arrival hall at Suvarnabhumi Airport. The price is 120 Baht and the buses leave on the hour up until 10pm at night. Starts at 7am in the morning. It takes 2 hours. I guess it’s been quite a while since I last looked at travel bags because I had no idea that they were now making these kinds of hybrid bags – bags which give you the look, practicality, and convenience of ordinary wheeled luggage, but also give you the option of carrying it like a backpack should the necessity arise.I actually used to be a serious backpacker myself and as such I have often spent weeks at a time navigating my way through very remote wilderness areas with nothing but what I could carry on my back. Even as an avid backpacker however I have to admit that never really quite understood the practice of using a backpack as luggage when traveling abroad through airports, bus stations, and city streets (to each his own I guess). 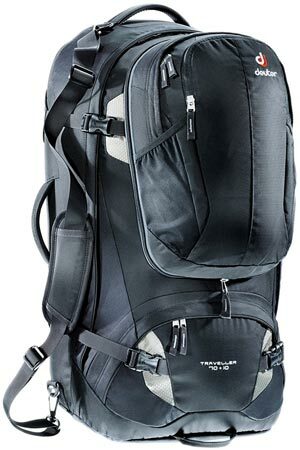 Although I naturally always pack a daypack in my luggage that I can use when I take short trips to more remote areas.Still, I kind of like the idea of a normal soft-sided wheeled travel bag that can be quickly converted to a backpack in the unlikely event that I should ever need it to do so (like the Osprey). And as long as the belt and shoulder straps stay completely hidden and out of the way when not in use I think I would actually consider buying one of these. And I also love the idea of having a detachable daypack.Anyway thanks for highlighting some of these great new options in travel bags. For longer trips I use my Deuter70 pack with detachable day pack. Has served me well over the years.Also make use of an Eagle Creek travel pack for shorter trips. Never been a fan of wheeled luggage but that's just my bias. Hi! I am traveling to Thailand for 6 weeks and want to know which backpack is best for me. I'm 5'4" and will only be bringing my backpack with me since I will be traveling throughout Thailand and will not bring suit cases. I definitely want something comfortable and light with a lot of room, wheels, and a detachable day pack. I would love any feed back !Also, nothing too crazy heavy or large due to I am a smaller woman 125lbs. Thank you! Hi Megan, if you want a smaller bag that is lightweight you may have to sacrifice wheels and the handle to pull it around. Click here to see this Osprey which has an adjustable frame to fit your torso. It's very light at 2.18 lbs, which is 6 or so lbs lighter than the Osprey featured in my post (the black one with the wheels). I'd go for the medium if you have a fair bit of stuff. AH! I really want to know which backpacks you recommend but there is no link anymore! Hi Stephanie, to find out more information, you can click on the pictures, or browse the carousel at the bottom of the post by using the left and right buttons. Ah-ha, that might be my problem. I think my Mac isn't showing the carousel. Thanks though, this post is extremely helpful. Thinking of something like this but guessing it'll be too small. You should see the preview now. I updated the code as it was a bit dated. Check out the Kelty Redwing one for something smaller. Hi Kim, you can find that one and very similar ones here on Amazon. All the best with your travels! Awesome post. This has really helped me choose. Can't wait for Thailand!